Add a touch of class and charm to your party tabletop arrangements! Offering a high level of durability and affluence, we house the finest quality Plastic Disposable Tablecloths & Vinyl Protectors, consisting of various stunning hues and suitable sizes. Our disposable Tablecloths are made of high-quality plastic that saves you from investing time in washing or cleaning the table linens. And our Vinyl Protectors offer the highest levels of protection from stains and spills that often happen in special event tables. Complete your tabletop decorations by adding these Plastic Disposable Tablecloths & Vinyl Protectors – perfect for banquets, catering halls, restaurants and party rental halls. Available at bulk prices and beautiful color options, these decorative tablecloths and protectors has managed to gain an immense popularity among all hospitality professionals. 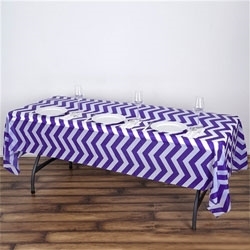 Why buy Tablecloths from RazaTrade?